The May 2013 "High-Tech Hoodoo: Conjuring Through Current Technologies" workshop sounds very interesting. For those of us that will not be attending, what will be available for sale and when? This is one of the most amazing projects i have ever worked on. 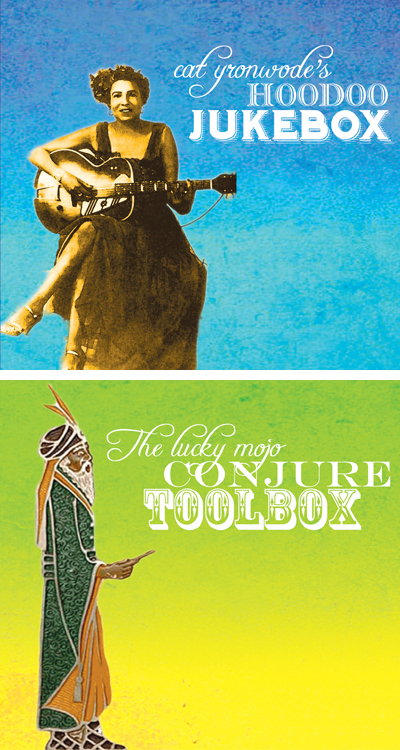 It consists of two parts: Hoodoo Jukebox and Conjure Toolbox. See http://luckymojo.com/hoodoojukeboxconjuretoolbox.html for details. The article that Kast Excelsior wrote for his May 2013 MISC workshop will be available in The Black Folder book. See http://luckymojo.com/blackfolder.html for details. The day after the workshop, we will be offering the two-CD set -- one audio disc and one graphic file disc -- to the public for the combined price of $12.00. Only 1,000 copies have been pressed. The Hoodoo Jukebox is a set of 26 songs by African American musicians that mention and describe the many facets of hoodoo.These authentic sources provide insights into candle magic, hot footing, mojo hands, black cat bone spells, spiritual shop culture, jinxing, the role of professional readers and root workers in hoodoo, and how to divine from omens and signs. 78 minutes of hoodoo music. 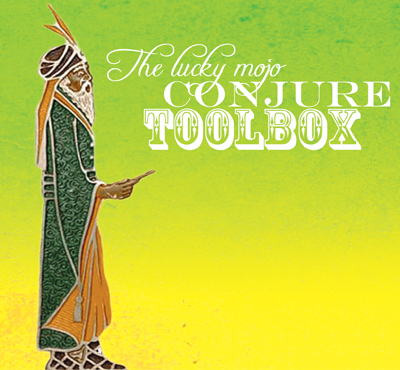 The Lucky Mojo Conjure Toolbox will provide you with an amazing arsenal of digital images to incorporate into your personal magical spell-work. These images are sized just right to be printed out as candle labels, carried as talismans, personalized as petition-papers, or adapted for use in the construction of multi-media hypersigils. Enhance them with photo-editing software — or collage them on the fly with simple scissors-and-glue techniques. Your capacity for innovation is limited only by your imagination! This Conjure Image Toolbox CD-ROM was originally distributed to attendees of the 2013 workshop, "High-Tech Hoodoo: Conjuring Through Current Technologies," presented by Kast Excelsior at the seventh annual Hoodoo and Rootwork Training Workshops sponsored by Missionary Independent Spiritual Church in Forestville, California. Read more about these annual workshops at MissionaryIndependent.org/workshops.html or in "The Black Folder" book, available at LuckyMojo.com/blackfolder.html and at hoodoo shops nationwide. For practical training on how to use candles and petition papers in traditional hoodoo rootwork, you may consult with members of the Association of Independent Readers and Rootworkers (AIRR) at ReadersAndRootworkers.org to arrange for magical coaching sessions that can be tailored to meet your spiritual needs. In the menu, you will find folders that link to every printable file on the disk. Select the file you want, and click to open and view it. Once you decide which image best represents the desired condition for which you are working, you are ready to incorporate the graphics into your spells. A total of 89 amazing free-for-use Hoodoo images! There's some great stuff coming to light, for this year's workshops. I'm truly sorry that I can't attend, but I look forward to checking all the new stuff out, later. Oooh! The music alone would be amazing (wow, what a selection!)... but the digital file in addition looks great too! Wow! This is great. It's on my list along with The Black Folder Book, etc. Gold, pure gold. I think we have a Number 1 record on our hands. There is now a web page on this item and you can pre-order! Gold indeed, Apollo! And looking forward to seeing ya up in Forestville again too, my friend!!! Yes, this is literally 2 for the price of one. I'm very Honored to be a part of this project and I can say that the work of a very potent team of rootworkers has paid off exponentially and summoned up a product that is going to be a collectible (and practical) legacy token within the very history of conjure practice for many decades to come. Listen to classic hoodoo Blues tunes with one disc while you print out material for A LOT of different spell work with the other disc: A Modern Conjure Folk's Dream Come True!!! Thanks for the link to the new page for it too, cat. Looks grrrrrreat!!! This is brilliant! Looking forward to this! YEAH! Woo! It's in my cart and payday can't come to soon! That CD is easily a collection of some of my favorite blues artists. Well done. Good mix of songs. A must have. Holy Smokes!!! I have to say the last few times that I have thought "Hey, it would be really cool if..." (ex: the two books by Conjureman Ali and the upcoming hoodoo candle book by Ms. Cat) and it happens and now a really cool hoodoo jukebox cd!!! *YAY*!!!! I just ordered my copy tonight. I already have all of the songs on different albums/LPs, but it is a treat to have them all in one place...on one CD. Hopefully the shop/Robin can track down Miss Cat and have her sign that beautiful cover for me! I can't wait to get this! I took some time out today to listen to the Hoodoo Jukebox. Some of the songs were familiar to me from a CD of hoodoo blues tunes that Miss Cat put together for the first or second MISC workshop weekend -- the first one I attended, I'm pretty sure. But I listened to them more closely today -- it's a great little history of Afro-American folk magic and what it meant to the people. The Jinx Blues by Son House was particularly eye-opening this time around. As to the Conjure Toolbox -- The Break Apart candle I burned for a client burned much better than previous Break Up candles did, so thank you, Dr. E! I'm sure the bold black, red and white artwork added an extra kick. Great! Now I'm even more excited to get this in the mail. Thanks for the update on your works and words on the cd. 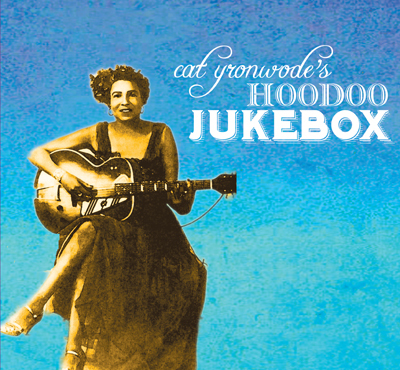 Listening to the Hoodoo Jukebox right now and just enjoying it. Man, this is just *good* blues. Mm-mm. Thanks for putting this compilation together! It's terrific. I've been a student of the Blues for years and have always wanted a collection of Hoodoo-themed tunes. But til I got this collection, probably the first such anthology, I didn't realize how many Hoodoo-referencing Blues tunes there were out there. This may not be everything Hoodoo ever set in wax, but 26 tunes is a lot. Never even heard of Black Spider Dumpling (nee John D. Twitty). Great job, cat, Kast, Prof. Ames, nagasiva, Dr. E, and Deacon Millett. I'm glad you enjoyed the collection. Actually i have at least 5 or 6 times more than these. If folks are interested, we may consider going to a volume 2 next year. I'd pick up Volume 2! There's interest here. magicmurphy wrote: I'd pick up Volume 2! There's interest here. Me too, MM. No question. I would be interested in getting them all. It is a very nice way to have all of these songs collected in one place. Very useful. I am listening while I type this. So Good! Opening a box from Lucky Mojo is fun and this was extra fun now that my house is filled with music. And I would absolutely buy volume two, three, four, and more. Now I am off to peruse the artwork in the Conjure Toolbox. Is the CD set still available with the Conjure Image Toolbox CD-ROM? I understand only 1,000 copies were printed so I wanted to make sure, I think this addition is ingenious! I just got mine. WONDERFUL! LOVE LOVE LOVE !!!! So very excited to get this. I was raised on old country and blues, and while I collect vinyl records, blues music is so hard to come by on LP! I just ordered it on Amazon, and while I much prefer to order all I can directly from Lucky Mojo now, my mom had gotten me an Amazon gift card for my birthday. I used the rest and downloaded some cool piano blues. I'm a country and gospel pianist learning the blues so I've been listening to it all day! Non stop! I'm sure it will be the same once my Conjure Toolbox gets here! Thanks to everyone who worked on this! It does not go unappreciated! BTW, this just occurred to me: will I need to buy another copy of this to qualify for the correspondence course since I used Amazon instead of LM?